Graham and I took our visitors to the Queen Creek Olive Mill for a tour and breakfast on Sunday morning. I didn’t realize how far of a drive it is from central Phoenix. It’s best to make a day of it by also going to Schnepf Farms across the street. For $5 each we took a tour of the olive mill. We learned so much about the mill’s history, how to make olive oil and olive-oil quality. Now I know what to look for when I next buy some. The mill building is a store, coffee shop, restaurant and tasting room. Outside sits a garden that grows organic vegetables. Inside, take your pick from gelato, breakfast foods, cupcakes, sandwiches, pizza (on some nights), and more. I tried out a frittata sandwich with a mashed potato for breakfast while Graham couldn’t resist the waffles topped with berries. The food was filling and made using the mill’s products. I was tempted to try a cupcake but I’ll save that for next visit. That morning there was also a complimentary wine tasting held outside. A band was setting up to play, but we missed it. There are plenty of picnic tables outside on which to enjoy a meal or glass of wine. Olive oil flavors include Meyer lemon, bacon and garlic. We tried some Superstition Coffee and chai tea latte. You can bring your drinks on the tour. We watched as olives were being pressed. Then we tasted olive oils. 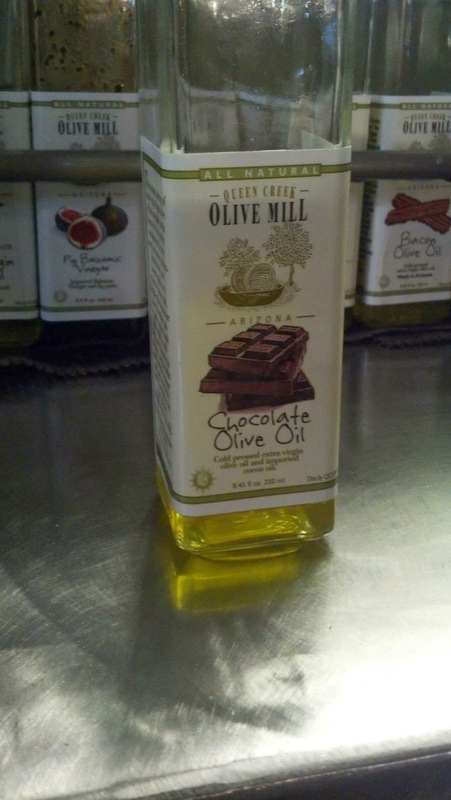 Have you been to Queen Creek Olive Mill?